Thermotherapy or heat therapy is the application of heat to the body for pain relief and health. The therapeutic effects of heat decrease joint stiffness, reduce pain and relieve muscle spasms and inflammation. The increased blood flow to the affected area provides proteins, nutrients, and oxygen for better healing which can be beneficial to those with rheumatoid arthritis, stiff muscles, fibromyalgia and injuries. 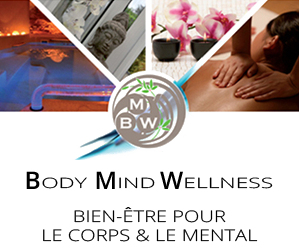 At the Body Mind Wellness Centre you can discover the therapeutic effects of heat in a state-of-the art whirlpool and infrared cabin. What are the benefits of an infrared cabin? If you’ve ever been in a traditional sauna, you know that the heat can be very humid and even claustrophobic at times. Not so in an infrared sauna. You’ll find the heat in an infrared sauna very comfortable and pleasant. Infrared heat is a completely safe form of naturally occurring energy that travels 2 to 3 inches deep into your body and profoundly warms you up. The deep penetration of the infrared energy in your body causes increased blood circulation, thus allowing more oxygen and nutritious elements to be transported to muscles and organs which relieves pain and increases mobility. Infrared heat regenerates your skin. It promotes a healthy tone and texture and helps cure several skin diseases like eczema, psoriasis and acne. Your pores are thoroughly cleansed while you sweat during your sauna session and all kinds of toxins leave your body via transpiration. Daily sweating can help detoxify your body as it rids itself of an accumulation of potentially carcinogenic heavy metals (lead, mercury, zinc, nickel, cadmium) as well as alcohol, nicotine, sodium, sulfuric acid and cholesterol. One liter of sweat in an ordinary sauna contains approximately 3% toxins, in an infrared sauna this is 20%! Infrared heat has a positive effect on your immune system. This helps ward off invading organisms and slows down virus and bacterial growth. After an infrared session you can chill in a relaxation area and listen to music.